Members of the Thayer County Leading Locally class experienced a day at the Nebraska State Capitol. The Thayer county group was joined by other leadership groups from Merrick, Seward and Wayne counties to learn more about the legislative process. The day at the Capitol began with a tour of the building followed by introduction of the groups as guests of local Senators while they observed the Legislative session from the Gallery. During the noon hour Senators Annette Dubas and Dave Bloomfield met with the group and explained legislative procedures. Just after lunch, the group of approximately 70 leaders from across Nebraska held a conversation with Governor Heinemann. 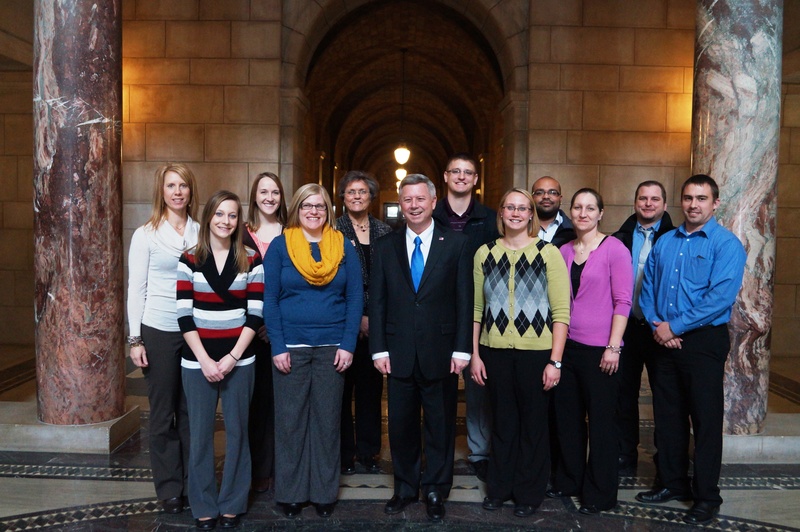 The Governor stated that he focuses on two main issues: education and jobs for Nebraskans. The Governor graciously took a picture with each leadership group. Lobbyist Bruce Reiker enlightened the group about Nebraska Hospital Association and Health Care issues. He stated that in today’s world issues are so complex and Senators are inundated with so many topics that Mr. Reiker viewed his job as a lobbyist to “Engage-Educate-Empower” regarding health care. Secretary of State John Gale told about the history of election procedures and how Nebraska has updated the election equipment and processes to increase speed and accuracy. Leading Locally in Thayer County will continue to meet throughout the spring to learn about county businesses, economic development and to increase leadership skills. This entry was posted in Uncategorized and tagged Capitol, governor, legislative process, legislature, senators. Bookmark the permalink.